Just a quick note to say that there will be no game review or Thursday ramblings this week or next week. I'll be back at the weekend with baking. One time, after SkyGuy had drank a few too many drinks, he took a taxi home with a girl he's met at a club. N.B. The above picture is just a representation - not the actual SkyGuy. SkyGuy then proceeded to get the taxi to the supermarket car park near his house. The taxi pulled up and he leapt out and ran across the carpark leaving the poor girl to pay for the taxi. 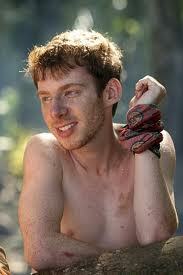 The most recent person I've started following on Twitter is John Cochran from Survivor Caramoan. What can I say? He's funny, charming and I think I have a little bit of a crush on him. I'm a huge Survivor fan - when Season 26 ends in a few weeks I'm going to post a series review. Baking this weekend has happened - recipe to follow on Thursday. See you tomorrow for my Tuesday "short"
Sorry I haven't posted this week. I've been too busy with work - I was evaluated by my boss and it was super stressful. That's all over now though and I'm back and posting. This story is part in honour of the end of JLS and partly in honour of my best friend "Skyguy" who always has the most amazing stories. 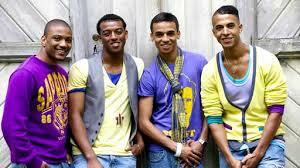 Recently, one of JLS (no idea which one) had arranged to visit Skyguy's work - as part of this deal, the JLS member's girlfriend would also be coming up to the work to meet her boyfriend there. On the day, the JLS member cancelled and so imagine the surprise when, after she'd travelled for around four or five hours, his girlfriend arrived at the workplace ready to see her boyfriend. Awkward situation. Nothing to update on the life front. It's just been such a dull week - literally work, sleep and eating. 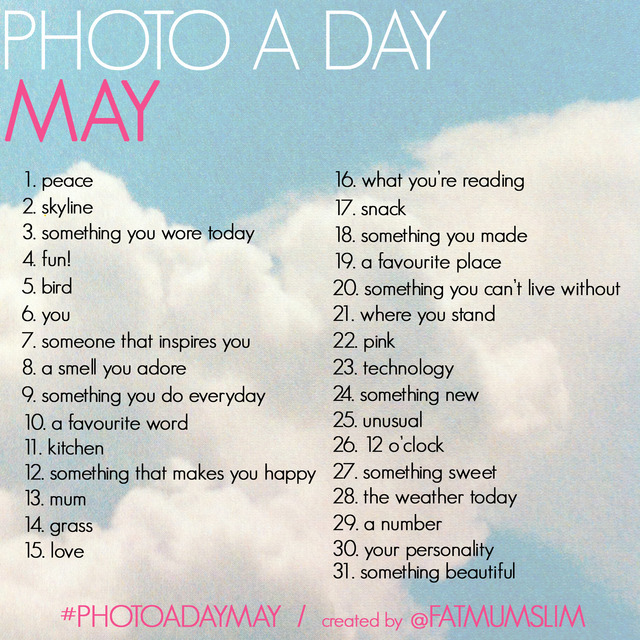 Below are the two challenge I will be doing for the next little bit. 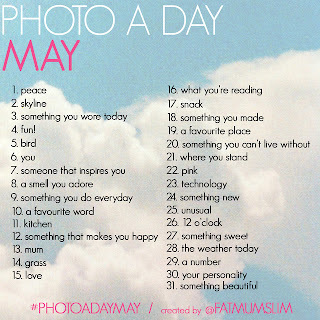 Below is the May Photo-a-day challenge that I'll be completing and a fifteen week about me challenge too. The first was enjoying the Easter holidays. As I work in Education, school holidays are so much fun. I didn't do much - but it was so nice to have the time off, lie-ins, lazy days and staying up late. The second thing is getting to spend some time with my family. I recently went out with my cousins, brother and Grandad for a day out and stuff like that is wonderful. We went to a National Trust property and had a great time exploring, learning about history and pretending to be apprentices. See you tomorrow for my first Tuesday "short"
Welcome back to Part 2 of my baking weekend. Today we're making "110 cakes." 110 cakes are super simple to make, and are perfect to make with children as it's all about the decorating and less about the measuring, baking, fiddly bits etc. You just add 110 grams of sifted flour, 110 grams of margarine (or butter to make it a bit richer), 110 grams of sugar, 2 eggs, a splash of milk and a teaspoon of baking powder into a bowl and whisk. When it's smooth, you put into paper cake cases and bake at 180 degrees for fifteen minutes. It makes 12-15 cakes depending on how big you want your cakes to be. These were cakes that are super easy to adapt as well: over the years, I've added chocolate chips, raisins and dried cherries into the mixture and various types of icing. melted chocolate, chocolate buttons, whipped cream, mini-eggs. paper flowers, sprinkles and fruit onto the top of the cakes. 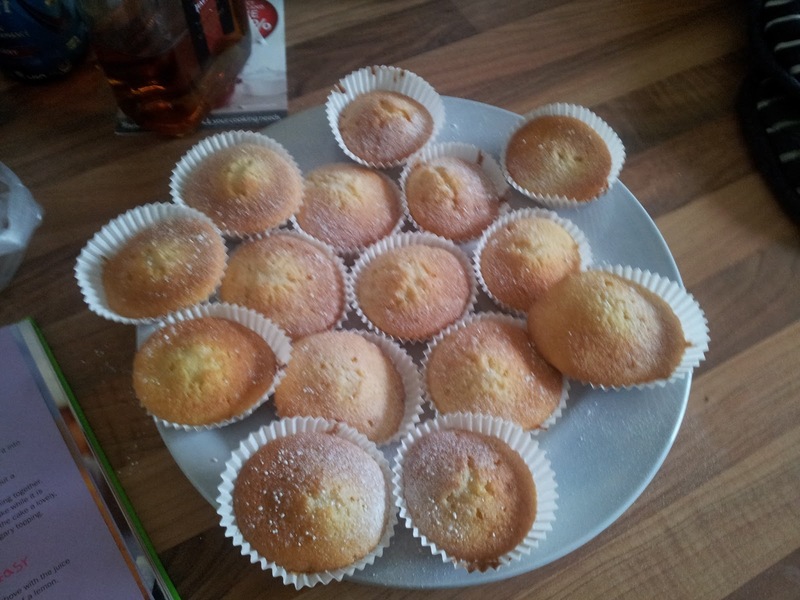 Today, I just went with icing sugar. The cakes last about three days, so I'll be taking some in my lunch box this week. Yummy. And so ends my first week blogging - just to say thanks to all the people who've read so far; I've been overwhelmed by the number of hits. If you do like this blog, or any of the posts, either join by Google friend connect (over to the left) or write a comment. 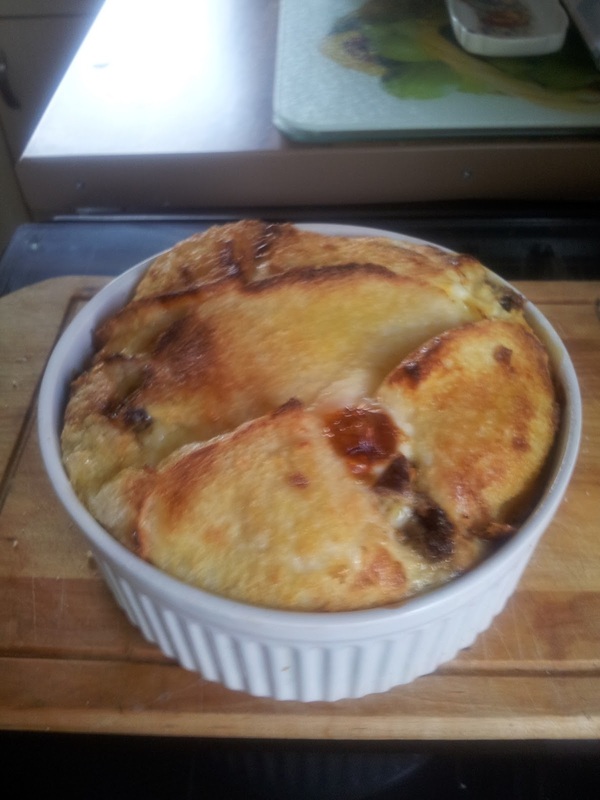 So, for my first weekend baking entry, I decided to make my all time favourite pudding: Bread and Butter Pudding. This was super simple to make: I buttered five slices of white, fairly stale bread and sliced them into halves and layered them into a greased dish. On top of each layer, I added dates and sugar. I prefer to use dates instead of the traditional raisins as they caramelise a bit more and, as I have a mega sweet tooth, they taste a little bit sweeter. After that, I just whisked half of litre of milk and two eggs together and poured the custard over the top. Finally, just before the pudding went into the oven, I sprinkled a little bit more sugar over the top to make the top nice and crispy when it had baked. I put it in the oven at 190 degrees for 35 minutes. The finished product. Looks good, right? Tasted wonderful too. And, looks like I'l be baking some more tomorrow, I'm making some mini-cakes for a family party so I'll blog how those turn out too.